Great graphics, sound, and atmosphere. Keyboard, mouse, and Panther compatible. Highly addictive, fast pace, in your face action. The original tournament style fragfest comes to the Dreamcast. 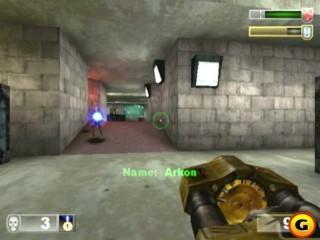 Unreal Tournament is the multiplayer romp with the weapons and environments made famous by the original Unreal. 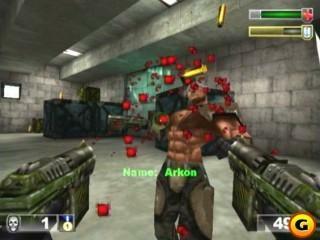 This game is multiplayer-oriented and was one of the many games on Sega's last console with online play. In fact, it is still possible to find servers that are up and still running this game. UT supports both dial-up and broadband, however, the broadband adapter for your Dreamcast will run you well over $100 as will the software to use the servers. Deathmatch - Your standard free-for-all. Team Deathmatch - Get to the required number of kills as a team. Capture the Flag - Get your opponent's flag to your base before your flag is taken to their own. Dominator (single or team) - Hold three control spots for a certain amount of time. They are done very well. Environments are robust and clean. The effects from the weapons impact the walls and blood splatters as well and can be seen all over the maps. The character models are good. Some characters' faces make them look constipated but it's minor when you're running around trying to stay alive and splatter their faces all over the wall anyway. The weapons have to be the best designed on a console for its time. All the little things move, like the barrel on the machine gun and the shells from the Enforcer as you fire. The music can get repetitive depending on how long you play a level. But even if it does, the music fits the levels and the action well so it isn't much of an annoyance. The sound effects on the weapons are done very well also, along with the "splats" and explosions. The best part of the sound design is what helps make this game unique: the in game banter from the characters. They're voiced very well and the comments always fit the action in which the character is in. Very nicely done. As a multiplayer game, replay value is high. But if you are a shooter fan in general, you will still have tons of fun with this game for a very long time. Just a five minute romp is very satisfying. And if you're lucky enough to find a server that still active, even better. The bottom line is that replay is very high. 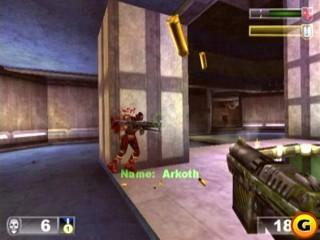 Unreal Tournament is one of the best games on the Dreamcast, period, shooter or otherwise. The design and polish make this game very appealing and the replay in single or multiplayer is fun as hell. 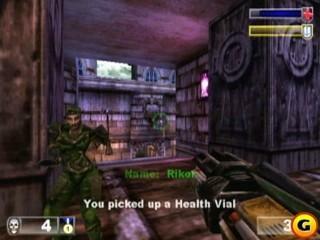 Even if you have Quake III: Arena, you should still pick this up. You'll be doing yourself a favor. And for less than $10 in most places, how can you not?